The Family Plot by Cherie Priest should carry a warning label: Do not read this book in bed at night. To avoid stress and shivers up the spine only read it outside in bright sunlight while wearing a large crucifix and with a bottle of holy water close at hand. An exorcist might not be a bad idea either. Music City Salvage is in serious financial trouble, so when Augusta Withrow offers to sell Chuck Dutton the salvage rights to the Withrow estate, he jumps at the opportunity. The property has valuable architectural details, including marble fireplaces and floors and paneling of chestnut worth a fortune. He can sell all of it piecemeal to decorators, builders, and contractors. Ms. Withrow wants forty thousand dollars for the salvage rights which Chuck doesn’t really have, but if he uses cent in his bank account and maxes out all his credit cards, he can make it—barely. To be fair to Ms. Withrow, she is unaware of how prophetic her statement is. Chuck assembles his crew—his daughter, Dahlia, to oversee the project, her cousin Bobby with whom she has a feud, Bobby’s teenage son, Gabe, and Brad, a nerdy college student working to earn his next semester’s tuition. It’s not an ideal crew, except for Dahlia, but it’s the best Chuck can do. She must have said it out loud. She is angry, has been since she lost her own old house in her recent divorce. Or else she is hearing things. Probably it is just an allergic reaction to all the dust or maybe a migraine coming on. Nothing to worry about. The Withrow carriage house reveals a surprise, but not a pleasant one. There is a trove of tombstones with no names. What kind of family stores tombstones in their carriage house? Tombstones aren’t the only strange thing. As Dahlia returns to the carriage house with tools and a lantern, she sees a flash of yellow. “It was only there for an instant: an impression of someone at the edge of her vision, off to the left.” But no one was supposed to be on the estate but the salvage crew, and none of them wore a yellow dress. As Dahlia takes a shortcut back to the carriage house, she stumbles across a cemetery. None of the tombstones bear a Withrow name, and all have dates from the early 1900s. Augusta Withrow didn’t mention a family plot on the property. When the crew returns to house for the night, they find footprints of someone wearing high heels who left clear palm prints on the stair bannister. Stress ratchets up when Gabe finds an old trunk and admits that a little boy showed it to him, then disappeared. “No, don’t you tell me that, I won’t believe it for a second . . .” But Dahlia does believe him although she won’t admit it. The trunk contains a photograph album of the Withrow family. When Augusta Withrow finally arrives at the estate after repeated calls from Dahlia, the claims the cemetery is a fake, a Halloween prank by her grandfather who owned a monument company. She denies that anyone is buried there. She also says she doesn’t want the family album. When a storm cuts off the electricity and cell phones can’t be charged, the crew is alone in the old house. Then Brad digs up a grave in the so-called fake cemetery; Bobby admits he has also seen a ghost; and no one wants to take a shower in any of the bathrooms. They are not alone in the Withrow mansion. 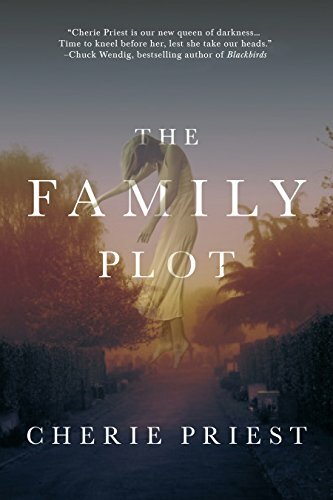 The Family Plot by Cherie Priest is more than just spooky; it is The Haunting of Hill House and Alfred Hitchcock’s Psycho entwined in a dark tale of murder, spiritualism, and a ghost who doesn’t want to leave the Withrow Mansion. Priest’s use of such a prosaic, unromantic blue-collar background as a salvage company is pure genius. The contrast between a salvage crew in jeans and work boots and a malevolent ghost in a yellow dress makes the plot more believable. Although some readers may be unhappy at the abrupt ending, it fits the overall story: No one knows when a ghost will appear or what it will do when it does.